Korea will consider keeping the Combined Forces Command in Seoul, but the plan to relocate the U.S. Forces Korea headquarters will be implemented as planned, new Defense Minister Han Min-koo said on Tuesday. The government will keep its promise to relocate USFK headquarters from Yongsan in Seoul to Pyeongtaek, Gyeonggi Province further south of the border, while taking into account of the changing security situation, and the threat from North Korea, Han added. 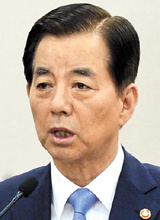 In his first meeting with reporters since he took the job, Han said, "Once full operational control of Korean troops is transferred to Seoul, the CFC was supposed to be dismantled or replaced by another military cooperative body, but things have changed as now the transfer will be delayed." He added further details will be discussed between Korean and U.S. officials.